Because, yes, Rotorua is an assault on the senses — most notably the sense of smell. These kids got a whiff of Rotorua. This olfactory assault is due to the high level of geothermal activity present in this North Island city — activity that has been drawing thousands of tourists each year since the 1800s. And 200+ years worth of tourists can't possibly be wrong! But what is it exactly that makes Rotorua such a great destination today, despite the strong smell of sulphur that blankets the town? Well, actually a lot of things. 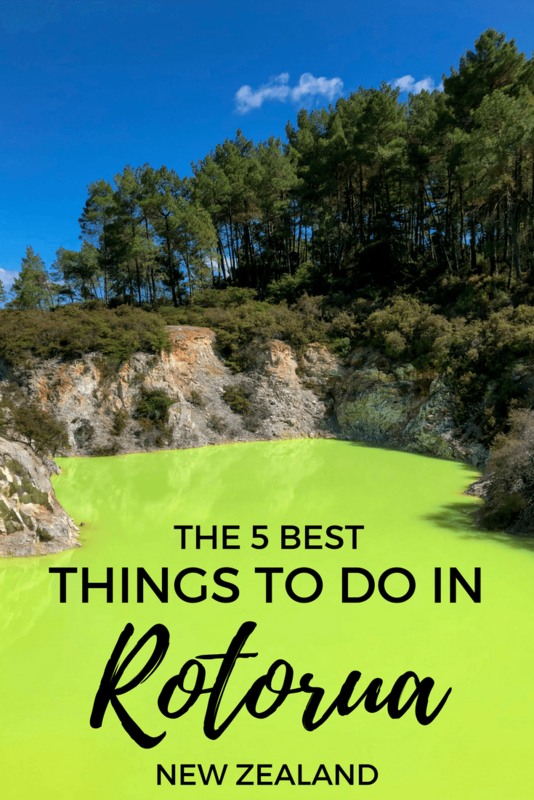 If you're headed to Rotorua anytime soon, here are a handful of things to add to your must-do list. Centuries ago, tourists came to Rotorua to witness the awesome power of nature in the form of the region's geothermal activity. New Zealand itself is located in the Pacific Ring of Fire, and therefore is very “active” geothermally. Back in the 1800s, tourists came to Rotorua to see geysers, boiling mud, and an area known as the Pink and White Terraces. It was suggested that these were so impressive that they could have given the 7 Wonders of the World a run for their money. Sadly, they were destroyed in a volcanic eruption in 1886. But don't worry — there are plenty of geothermal wonders left to see in Rotorua, from boiling mud in the middle of downtown, to the Lady Knox Geyser, to geothermal wonderlands. Or, if you'd rather a more relaxing approach to the power of Mother Earth in Rotorua, you can visit the Polynesian Spa, where you can dip into a variety of thermal pools overlooking Lake Rotorua. The pools are filled with geothermal mineral water sourced from two nearby natural springs, which really does make your skin feel lovely. While you can get a taste of New Zealand's native Maori culture all over the country, Rotorua has perhaps the most offerings. Not only are native hakas performed multiple times per day outside the Rotorua iSite (information center), but there are also a number of Maori replica-villages you can visit here. Places like and offer nightly dinner-concert packages, which include a traditional hangi dinner (food cooked in an earthen oven) along with a concert/show that includes traditional Maori songs and dances. Yes, these are touristy experiences, but they are very well done and absolutely worth it, especially if you don't know much about Maori culture. An evening dinner + performance package isn't cheap, though, so if you want to save some money you could check out , which has geothermal stuff AND some Maori cultural performances during the day. Rotorua has been nicknamed “Roto-Vegas” because of the city's number of motels and neon signs, but anyone who has actually been to Las Vegas will tell you that Rotorua is nothing like Sin City. Rotorua is actually a super cute New Zealand city set on the shore of Lake Rotorua. You can enjoy some beautiful architecture like the Rotorua Museum and even the iSite, take a stroll in the Government Gardens, and grab dinner on Eat Streat. You can also get great views of the city and Lake Rotorua by going up the . Seeing as how New Zealanders are obsessed with adrenaline sports, it should come as no surprise that Rotorua has some of its own to offer. The must-do activity here is zorbing, where you dive into what looks like a giant hamster ball and are rolled down a hill. 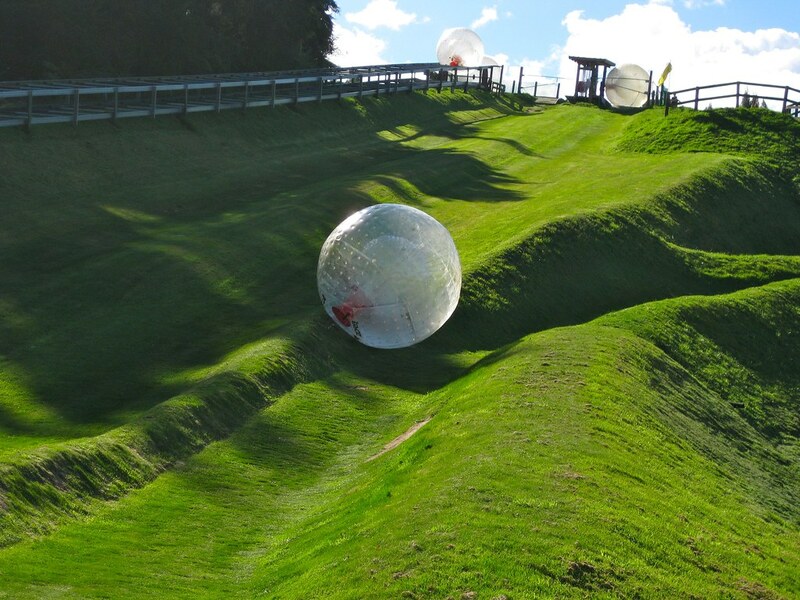 Go with either ZORB Rotorua or OGO, and have a blast. You can also head over to for everything from bungee jumping to the giant Swoop swing, or luge down the hill from the Skyline Gondola. This redwood grove in Rotorua was planted as an experiment starting in 1901 in an attempt to replace the native NZ forests that had been cut down for farming. Someone thought redwoods might grow well in Rotorua, and so a bunch were planted not far from downtown. As it turns out, Rotorua has an even better climate for growing redwoods than their native California does! They've flourished in this part of New Zealand, with the tallest being over 70 meters tall right now. You can admire the redwoods from the forest floor (for free! ), but the best way to experience these giants is to do the Redwoods Treewalk. You traverse a series of suspension bridges up in the trees, giving you fantastic views of both the redwoods and the surrounding forest. I did this walk during the day, but you can also do it at night when there are lights twinkling in the trees. Rotorua is well-situated in the center of New Zealand's North Island, meaning it's close to several other attractions that you might want to visit. Using Rotorua as a base, consider visiting places like Hobbiton, the Waitomo Caves, Taupo, or even White Island (an active volcano). When it comes down to it, there's really no mystery why Rotorua has become such a popular destination in New Zealand. With everything from geothermal wonders to Maori culture to adventure sports, it really does offer enough of a variety of activities that you can almost overlook the smell. Is Rotorua the type of town you'd add to your New Zealand itinerary? Rotorua is an excellent place to visit! Though my clothes all smelled funky after I left – ahh well, it washes out. Another cool adventure activity that I did there was raft the world’s highest commercially rafted waterfall on the Kaituna River nearby. Definitely recommended! Ooo, rafting would be fun! It’s amazing the variety of things to do in such a small city. A testament to the awesome-ness of New Zealand, for sure! It reminds me of Yellowstone but with Maori culture! Is the smell pretty persistant across the entire city or just near the geothermal sites? And yes, the smell is pretty persistent, no matter where you are in town. Definitely takes some getting used to. Loved Rotorua! Really you get used to the smell pretty fast. And I think it’s like Yellowstone must have been long, long ago. Definitely take the trip up to the Waimangu Volcanic Valley, which was formed just about 100 years ago! I agree that you get used to the smell once you’re there for a little while. The stink certainly wouldn’t keep me from going back! There’s so much to see there in a relatively small area. I liked Rotorua. And yes I remember the smell! I think it would be hard to forget the smell. 😉 Glad to hear you enjoyed it anyway, though! We lived in New Zealand 9 years ago, so this brought back memories. Rotorua is heaps of fun! The Swoop Swing and Zorbing look like so much fun! I bet it took a lot of courage to strap into that swing. The landscape is absolutely breathtaking and is worth the visit to Rotorua alone. I think I could get past the smell…I hope. They WERE both really fun! Zorbing was so random, and yet so fun — I don’t think I’ve ever laughed so hard! And the Swoop was actually terrifying! And I’m sure you could get past the smell. Most people do! I lived in Rotorua for a couple of months, and must say, it’s a brilliant place. Awesome scenery, great (and cheap for NZ) adventure activities, and so much on the cultural side. Great photos here! Agreed that the adventure sports here are cheap! And all the cultural offerings are well worth the time and money. How long did it take you to get used to living with that smell 24/7 for months? I love RotoVegas! If you go with it being super touristy in mind, you’ll have a great time. I saw the sheep show at the Agrodome and liked it so much, when my family came to visit, I made my mom and sister go to it as I knew they would love it to. And my (teacher) mother LOVED it! Kitch and touristy, but always so much fun. It’s the city I ended up in the most (outside of AKL) for so many various reasons. A must visit! 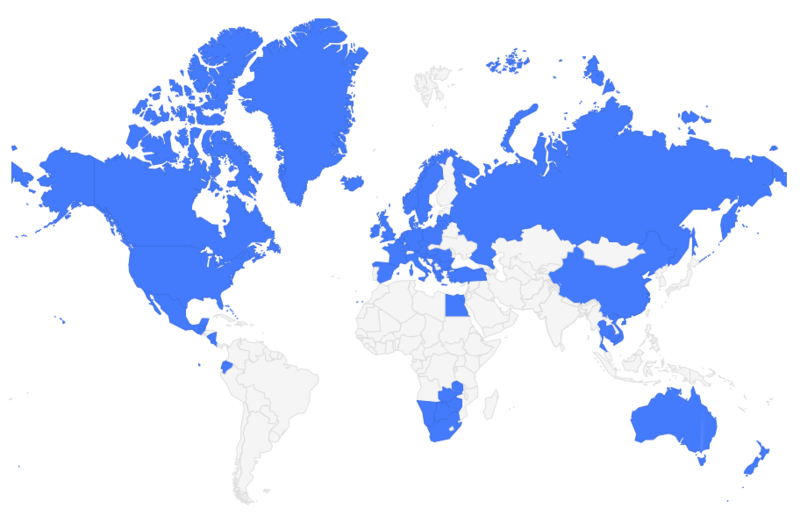 Though, it’s worth pointing out that “super touristy” in New Zealand is NOTHING like “super touristy” in other places around the world! Plus, all the kitsch and touristy stuff in Rotorua is well worth experiencing, in my mind! It’s such a unique part of the country. Love the photos. Looks like there’s a lot to do in Rotorua. Thanks, Alouise! And yes, there’s really a lot to do in Rotorua, considering that it’s not very big at all! Is this the best place to see a Maori cultural show? Most of the reading I’ve done so far says yes. I know I need to see it while I’m there, I was just hoping to find the least-touristy, most authentic experience I can find. Definitely the best place to see a Maori cultural show! You can see them elsewhere, but the ones in Rotorua are great. I’m pretty sure I went to Tamaki Village for the show I saw. The thing worth mentioning here, though, is that most of these ARE going to be pretty kitschy. You’ll nominate a “chief” for your tribe, and they’ll make a few of the men in the group attempt a haka, among other “touristy” things. But I promise that the experience will still be worth it! And the food? Very authentic and delicious! Yeah, you get over the smell pretty quickly once you realize all there is to see and do in Rotorua! Quite smelly, but I definitely want to go back. The bubbling mud pools were wild, and reminded me of the Bog of eternal stench from Labyrinth! I had a packed itinerary that day and couldn’t give Rotorua the attention it deserves so I’ll have to go back soon! Good to show everyone that there is much more to do in Rotorua then stopping to smell the…sulfer. Yes, you really should go back! I myself really want to spend more time there one of these visits, too. Despite Rotorua being quite small, 2 days isn’t even enough! I wonder how long it takes to get used to the smell. Although it sounds like there is quite a bit to distract you from the smell of sulfur! I’m not sure how long it would take you to *totally* get used to the smell… but I think after the first few hours you start to forget about it a little bit. Love the photos, especially the adventures ones. Remember passing ZORB Rotorua, but it was closed. Got to zorb sometime! Didn’t even notice the smell after a little bit. You definitely have to zorb sometime! It’s SO much fun! This brings back memories from New Zealand. 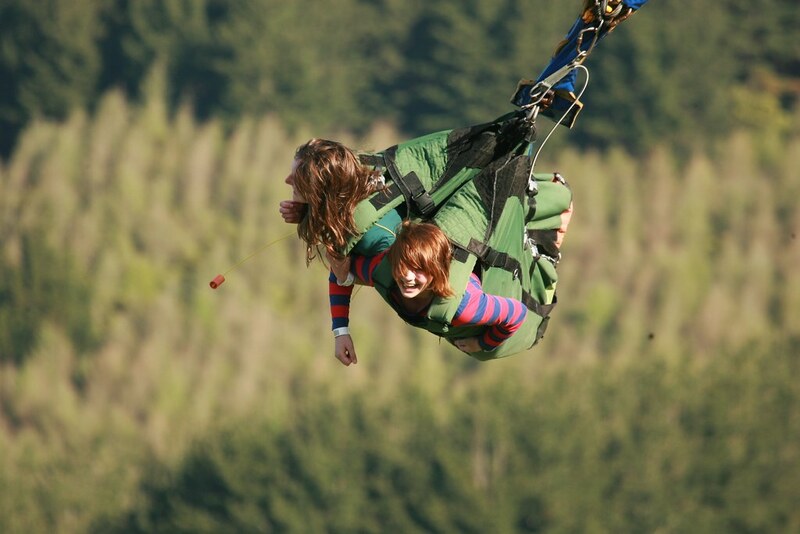 I spent a couple weeks in the North Island with friends and did Rotorua and zorbing in one day – so much fun. The North Island often gets overshadowed by the raw, amazing beauty of the South Island. But the North Island is pretty damn cool, too! I know the same people who run ZORB Rotorua have opened a zorbing operation in Tennessee, too. I really want to get down there to try it out on home soil! Most towns have a river or creek flowing downtown, Rotorua has boiling mud! Definitely it is impressive. I’ve never been there, and the first time I heard of it was while watching an episode of Australian TV-series “Underbelly”. One of the characters was from Rotorua, NZ. I always thought that when I had a chance to visit the North Island–at the moment I’m familiar with the Christchurch area only–I would rent a car from Auckland and drive to Rotorua. Quite childish that you want to visit a place only for having heard of it in a tv series located somewhere else, but that was enough to start my curiosity. What beautiful photos. The same blue sky I remember from Lake Pukaki. The smell of Rotorua certainly does seem to make a terrible first impression. The fact that the stunning and unique scenery can help to forget this smell says a lot about the landscape! Doing all those adventurous activities looks like such fun! My visit to New Zealand was filled with exciting adventures and adrenaline-pumping activities, with Rotorua being just one of the many incredible stops throughout the spectacular North Island.